Situated in the quiet neighborhood of Richmond Circle, Adarsh Hamilton is one of the best business hotels in Bangalore’s Central Business District. The spacious rooms of the hotel come with a wide range of amenities, such as satellite television, work desk, in-room dining and others. If you’re planning corporate meetings or business conferences, there are many elegant banquet halls and meeting rooms at your service. The business centre also has high-end audio-visual equipment. Dining options: Adarsh Hamilton offers a wide range of cuisines to guests at the in-house restaurant, Season. 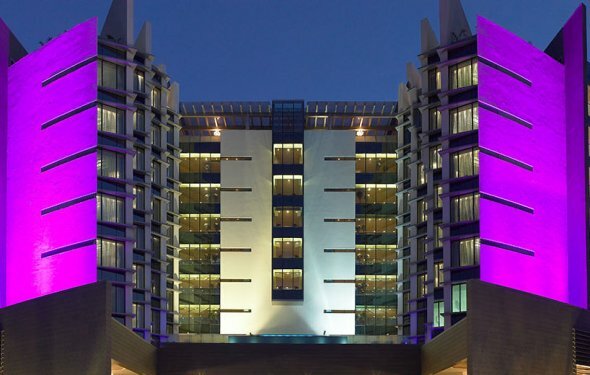 While looking for top hotels in Bangalore near the airport, you can’t miss Mövenpick Hotel and Spa. Conveniently located within 40 minutes of the airport, this hotel is the perfect mix of Swiss passion and Indian hospitality, making it one of the best 5 star hotels in Bangalore. After a long day of work, you can relax at the spa, the swimming pool or burn off the stress at the gym. Dining options: The hotel’s award-winning restaurant, Mezzaluna, offers one of the best fine dining experience in the city. For a late-night snack or meal, visit My Place, which offers Swiss specialties and an excellent Sunday brunch. The rooftop Sky Brew opens only during weekends to let you enjoy Oktoberfest-style beer alongside German cuisine. Ramada Encore is a contemporary hotel for leisure and business travellers alike. It is conveniently located in the heart of Bangalore’s Central Business District, and is within walking distance from the Embassy Golf Link Business Park. Guests can have easy access to the famous M.G. Road with its dining and shopping options. It’s also close to the airport. Dining options: The Hub offers bountiful buffets and a wide range of delicacies from international cuisine to guests. It’s considered to beone of the best restaurants for social and casual scene. After dinner, you could spend some time at The Bar to enjoy a glass of wine. It’s just what you need after a long and tiring day. Good Budget Hotels in Madurai Near Railway Station.